These pictures are not modified in any way. While visiting the city of Pezenas in the southern France I discovered this strange door. Following a tip from one of the comments below I have contacted the tourist board of Pezenas. They have promised to send me information through the good old postal mail. I will make a new article here on my blog when the information arrives. I guess I am just too modest… And really, I actually did not realize how extremely strange this door was before I saw my own pictures of it. Freaky indeed! Anyone any closer to a better suggestion on this one? Why is it designed like this? Is this usual for the south of France? Who did it? The pictures are not modified in any way. I took the pictures myself because the door looked even more spooky in real life. It is designed with that really weird perspective! I think i know what would be inside. They need no layout either – see the pics for example. Built very strange. Interesting gate, good photo, much unnecessary hype. I guess there’s something like this in the Cathedral (Bazilika???) of Eger (a nice town in Hungary, http://www.egeronline.com/index.php?lang=en). Very funny, I’m from Eger. AFAIK, there isn’t anything like this in the Cathedral – at least not on the outside, maybe inside (not visiting it often), in the crypt. This is a century-old blog. Thank you very much! I have still no clue about why this door was designed like this, but I have learned that there is a very nice city in Hungary called Eger. Strange doors or not strange doors. At some point I’ll have to visit Eger! Someone on szanalmas.hu said that this must be with connection of the baroque era. Architecture based on one viewpoint. It would be interesting to know which is the point from the gate is visually perfect. If you take a photo from that point, all other buildings will be skewed, but the gate. I hope it helps. 🙂 Good photos, BTW. Good idea. I have sent them a message and will of course post here if I get an answer. If anyone out there live in or near Pezenas, please try to snap a picture like that and comment here! And here is the link to the photos over at flickr. 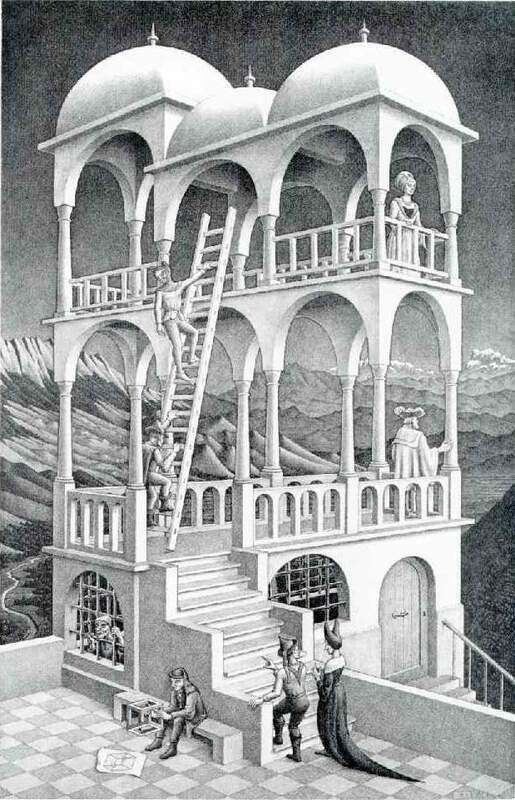 This kind of illusions were very common in the mature renaissance, and in the baroque, since the -then newly rediscovered- laws of perspective were a common source of amusement, and decoration. Actually, this kind of distorting the architecture, to misled the eye was even practiced by ancient greeks, in the building of the Parthenon. As you see in the middle of the picture there is what is seem to be a little steep street, while it is actually a two or three meters deep facade, which is only enjoyable from the very center of the auditorium. So to cut a long story short: this door was made by order of man who did not have enough money to build a big house, but did have enough to build one which looks like big. Well, from a certain vantage point, that is. The internet is a cool place. All sorts of intelligent and friendly people hanging around. Thanks again.